Shelley West has been writing for companies in the entertainment collectibles market since 1997. She also covers travel, entertainment, pop culture, fitness, nutrition, personal finance, graphic design and consumer technology. West holds a Bachelor of Science in corporate communication from the University of Baltimore and is pursuing her Webmaster certification. Ganoderma lucidum — more commonly known as reishi mushroom — is a bitter mushroom, used for thousands of years in Traditional Chinese Medicine in the treatment of multiple ailments. Called the “mushroom of immortality,” it's an adaptogen, which assists the body in adapting to both mental and physical stress. Both the caps and the stems of ganoderma contain a substance called beta-glucans, which boosts the immune system. Ganoderma lucidum is a large, woody and tough mushroom used for various herbal remedies. 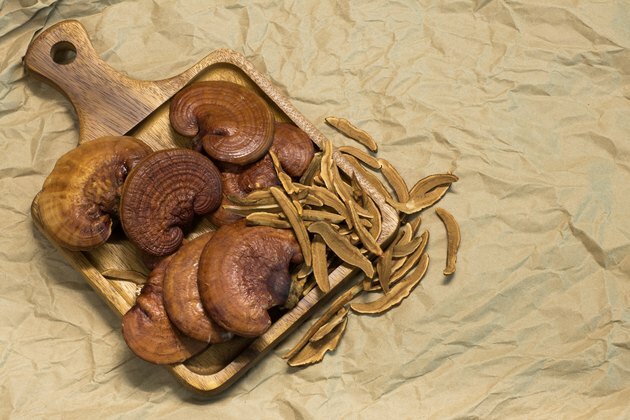 More commonly known as reishi or lingzhi, this mushroom may have beneficial effects on the immune system, cardiovascular system and prostate gland. Although ganoderma extract is generally safe and most side effects are mild, the Memorial Sloan-Kettering Cancer Center cautions that many of its claimed uses are for serious diseases. Thus, people should obtain medical attention in addition to using ganoderma extract to treat serious illness and consult with a physician about possible interactions of ganoderma with medication. There are many reported uses for gandoderma. Most of the studies conducted with reishi mushrooms have been on animals or laboratory studies, but a few human studies exist. More and more individuals are working to reduce the amount of medications they take or looking for more holistic or complementary methods of treatment. While ganoderma may not be right for every individual or every ailment, there are some health benefits worth noting. Men with benign prostatic hyperplasia (BPH) have symptoms of frequent urges to urinate, nighttime urination, decreased urinary flow and incomplete bladder emptying. 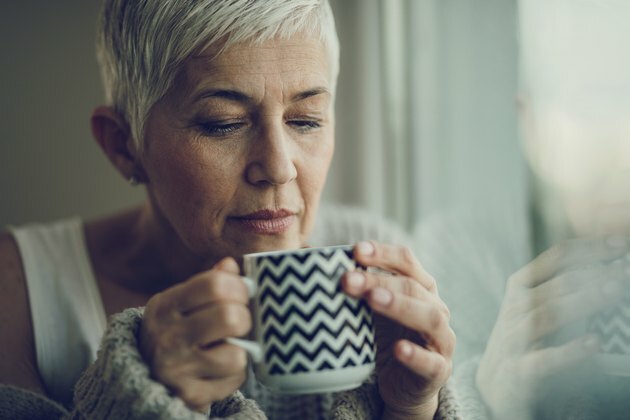 A 2012 review published in Journal of Mid-Life Health indicated that ganoderma may have a beneficial effect on the treatment of BPH by inhibiting 5 alpha reductase. Many treatment options for BPH include a 5 alpha reductase inhibitor, which can slow down the progression of BPH and decrease prostate volume. The studies regarding ganoderma and BPH are mostly animal studies, but they show promise for future research. Ganoderma extract may stimulate production of various types of white blood cells that help prevent and fight against infection. While it's not recommended as a first line of defense for cancer treatment, it may help boost immune response. 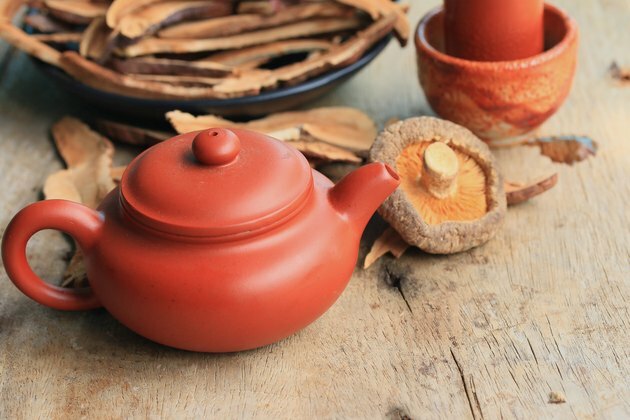 A 2016 Cochrane Review of the use of ganoderma for cancer treatment found that cancer patients who were taking the extract were more likely to respond to their treatment. They also found those same patients had a stimulation in their immune response. Many plant based therapies are successful in their treatment against inflammatory ailments, such as cancer, diabetes, and obesity because of the anti-inflammatory compounds they contain. Researchers found ganoderma extract to exhibit anti-inflammatory effects against cancer cells in a 2017 study published in Nutrients. The positive effects of ganoderma against inflammation and cancer is thought to be due to triterpenoids and polysaccharides, two compounds in the mushroom, with the polysaccharides having the greatest effect on the inflammatory response. Chronic fatigue can be caused by both physical and psychological stressors. The triterpenoids and polysaccharides in ganoderma responsible for its antioxidant activity also play an active role in its ability to fight fatigue. A 2017 review study published in BioMed Research International indicated that ganoderma may work to decrease fatigue during exercise and increase swimming endurance by limiting lactic acid accumulation. The researchers also point to adenosine, a component of ganoderma, which can decrease the thickness of the blood and improve the capacity of the blood to carry oxygen throughout the body, which may provide more energy. It is possible that ganoderma polysaccharides may help with blood glucose control, associated with diabetes. Researchers published in 2004 in the International Journal of Medicinal Mushrooms used the polysaccharide extract from ganoderma on human subjects with type 2 diabetes over 12 weeks and found it was effective in lowering blood glucose levels. And a 2016 review in South African Pharmaceutical Journal concluded in its findings that ganoderma appears to be effective for lowering blood sugar which may either prevent or help in the treatment course of type 2 diabetes. While ganoderma has the potential to treat a wide array of ailments, check with your doctor before taking it as there can be side effects. Most side effects are reported after long term use. As previously mentioned, taking ganoderma isn't right for everyone or every health condition. If you want to start taking it but meet one more more of the following criteria, speak to your doctor first. Liver toxicity was reported in two studies with the use of powdered reishi mushroom, so use with caution. Traditionally, reishi mushrooms are made into a decoction, or boiled in water to extract their medicinal properties. The roots are boiled and then strained and drank as a tea. The extract of ganoderma is typically what you will find in supplement form. There is no safe recommended dosage of ganoderma extract, but a 2015 Cochrane Review cited research that used 1.4 to 3 grams of ganoderma per day. As always, speak with your doctor to find a dose appropriate to your age, gender, and medical condition. The University of Michigan recommends 1 to 1.5 grams per day of ganoderma in the powdered form, or 1 millilter per day as a tincture. Ganoderma is also available in coffee form, which is usually a mix of coffee and ganoderma powder. Current and ongoing studies are hoping to unlock the potential of ganoderma and possibly assert more effectiveness in a recommendation for this herb. For example, they're exploring the possibility of ganoderma as an additive to yogurt and as Kombucha made with reishi mushrooms. It's always a good reminder that that supplements are not regulated by the FDA as tightly as medications, so keep that in mind when choosing a supplement. Never choose a supplement that claims to cure or treat a specific condition. Have you ever heard of ganoderma before? What about reishi mushrooms? Did you know they were the same thing? Have you ever taken it? Did you drink it in your tea or coffee? Or prepare it some other way? Did you know about all the potential health benefits and side effects? Share your thoughts in the comments below! What Are the Health Benefits of Ganoderma Lucidum?